It seems simple, doesn’t it? 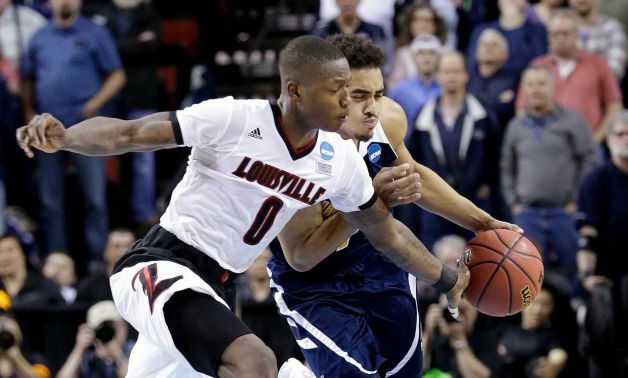 In reality, nothing is more taxing than fighting to come out on the winning end of a nip and tuck NCAA Tournament game, especially one that goes to the wire. And taxing it was Friday afternoon for Louisville as the Cards found themselves in their own version of basketball taxation. It took everything that UofL had to ward off a valiant effort by the Anteaters of the Univ Cal-Irvine and advance into the field of 32. The game featured numerous lead changes and momentum swings and was capped off by a scramble on the floor as time expired. Card fans from all over could finally exhale. 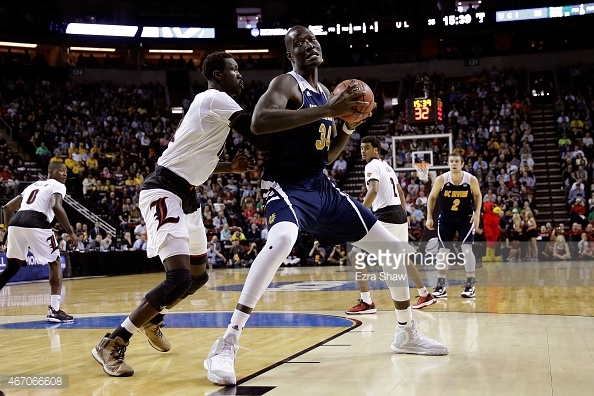 In a game where only eight total free throws were attempted by both teams, there was a lot of physical play highlighted by the low post action involving UC-Irvine’s 7’6″ behemoth Mamadou Ndiaye. I have not seen a physical presence in the middle like Ndiaye since the days of watching former University of Kentucky center Shagari Alleyne. Ndiaye was literally unstoppable when he received the ball deep on the block and on offensive put backs. Louisville’s centers who both stand at 6’10” were dwarfed by Ndiaye and had to finally resort to doubling him in the post to slow down Irvine’s offense. The strategy appeared to work thankfully as Ndiaye became less effective late in the game and was scored on at the rim by Wayne Blackshear inside of a minute left to play. Speaking of Wayne Blackshear, I couldn’t be more proud and happy for a kid who along with freshman Quentin Snider was the team’s MVP on Friday. Despite shooting for a modest average from the field, Wayne made the big plays down the stretch. 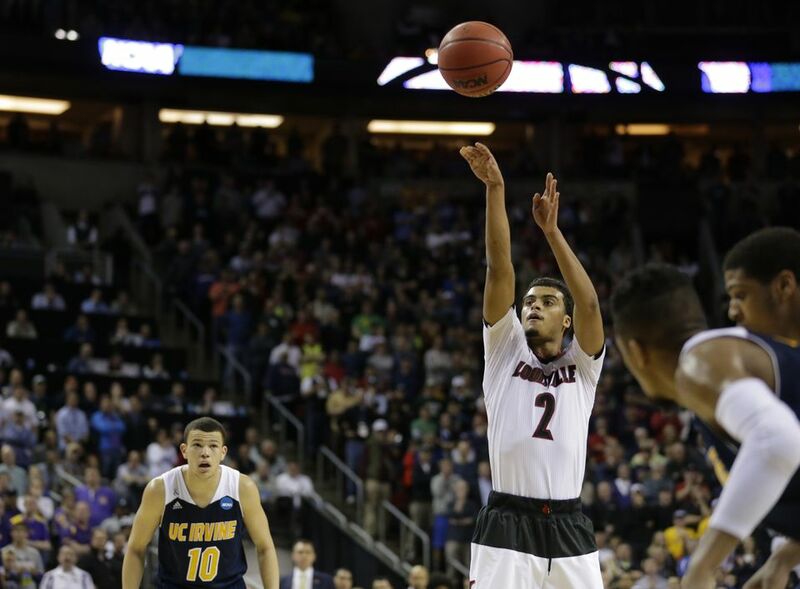 It certainly isn’t news to Louisville fans that Blackshear’s career as a Card hasn’t quite lived up to the lofty expectations set forth before he ever put on a jersey. And in the spirit of discussing one coming up short, Blackshear entered Friday’s game only 21 points shy of scoring 1,000 for his career. His last bucket, a huge one, gave him 19 as he slashed to the hole and scored Louisville’s last field goal of the day. Wouldn’t it have been fitting for the Cards to trip up and lose with Wayne being SO close to such an important and career defining achievement? Maybe. But just maybe the tables of fortune finally turned in favor of Wayne. He will now get another fresh 40 minutes to reach his milestone and more importantly help his team advance further in the tournament – and I’m damn happy about it. Louisville’s next opponent, Northern Iowa, is a quality team that will push the Cards to the limit. Play like they did today and it could be sayonara for the red and black. One would have to think, however, that Louisville will play more efficiently on Sunday as getting that first game under your belt is sometimes the hardest one a team faces. I have to tip my cap to Quentin Snider who grew up right in front of a national audience today. His ability to get into the lane and make short jump shots was invaluable and the clutch free throws to put Louisville ahead near the end were impressive and symbolic of the freshmen’s cool calm demeanor. I feel really good about Snider’s future as a Card. Before concluding, I did want to lastly give props to Terry Rozier who, despite not being much of an offensive factor on Friday, came up with the game sealing steal. Oh, and for the naysayers….Terry didn’t foul contrary to popular belief. Job well done. Now the waiting game begins. Sunday can’t get here soon enough. I have accepted this Louisville team for what they are: a group of guys that play hard despite being short handed and lacking in the area of experience and God-given talent. I do have questions regarding the lack of minutes for certain players but it’s too late into the season to worry about such a quagmire. I’ll support whoever is on the floor and will remember this team in a positive light after refusing to give up today and down the stretch of the regular season.. Give ’em hell on Sunday Cards.